The Good Shepherd is a key theme in Psalm 23 as well, "The Lord is my Shepherd..." which is a very comforting chapter for people who are going through difficult times. The theme for this window is based on a painting by the German artist, Bernhard Plockhorst (1825-1907), a professor at the Weimar Art School. He was best known for paintings of religious art. This and other works have decorated Bibles since the nineteenth century, and Plockhorst reproductions are sold today on the Web. Rich colors appear in this window (left). Christ wears a ruby red robe overlain by a cloak of mottled deep green and gold. His face is tanned, and the shepherd’s crook in his hand has become the hallmark of a bishop in the Episcopal Church. White stratus clouds appear in a blue sky. In 2006 a foot-wide outer pane fell from a double-layered section of the glass window, leaving a horizontal strip near the top where the sky is a deeper blue than the glassmakers intended. The window is unsigned but verified by church records and is regarded as Louis Comfort Tiffany’s own design. The window was given in memory of Thomas Streatfeild Clarkson (1837-1894), a popular Potsdam businessman and community leader who died on August 19, 1894. His death occurred unexpectedly from injuries suffered in an accident at the Clarkson sandstone quarry on nearby Sugar Island (in the Raquette River). A bachelor, Thomas and his unmarried sisters (including Frederica) lived on Clarkson Hill. Thomas had financed the construction of a chapel at Trinity Church as a memorial honoring his brother, Levinus (1835-1876), and deceased father—another Thomas Streatfeild (1799-1873). The Gothic structure was opened to the public on June 21, 1885, on the 50th anniversary of the founding of the church. 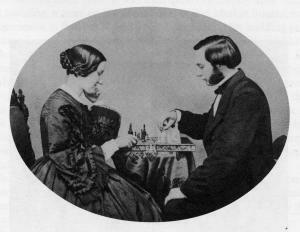 playing chess with his sister, Lavinia (1842-1926). in the church (those above the altar—not made by Tiffany). In addition to the 1895 window, this well-liked, philanthropic gentleman was honored with another memorial a year later when his sisters dedicated the Thomas Streatfeild Clarkson Memorial College of Technology on Main Street on what would have been his 59th birthday.